What is the NBA Live 19 game? EA Sports Basketball Game - NBA Live 19 is a basketball simulation video game developed by EA Tiburon and published by EA Sports. It features Joel Embiid of the Philadelphia 76ers as its cover athlete and was released for PlayStation 4 and Xbox One on September 7, 2018. The game is the 22nd installment in the NBA Live series, and the follow-up to 2017's NBA Live 18. If you have played previous NBA Live 18 game, you will feel everything changed in NBA Live 19, which much like EA's Madden NFL 19， the game includes gameplay improvements, with the new added real-player motion and the expansion of one-on-one features. It also is the first basketball game to include the option to create a female player. You can also establish your ultimate team in LUT 19, and complete with others. What can NBA Live 19 Coins be used for? NBA Live 19 Coins can be used to buy your desired players in EA Sports NBA live 19 game. With enough NBA Live 19 Coins you can build your dream team easily. 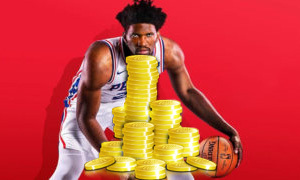 Why choose Joymmo.com's online shop to buy NBA Live 19 Coins? Joymmo.com is a well-known NBA Live 19 Coins online store because of its reasonable price, safe payment and 24/7 Live Chat online service. Buy cheap LUT 19 coins with instant delivery from us, and enjoy it on PS4, and XBOX One.